High quality switching AC to DC 5V 2.6A power supply. This power adapter can handle international voltages from 110V to 240V 50/60Hz switching inputs automatically and outputs in DC 5V 2.6A. 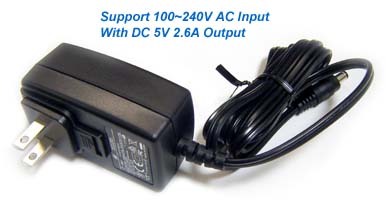 This is the replacement power adapter for our HDV610, SDV3 and HDV5 model.